A little over a year ago, a fresh Chinese startup by the name of Smartisan ("smart" and "artisan" combined) showed off its first work: the Android-based Smartisan OS. What caught our attention was its truly unique UI and insanely thoughtful UX features, so naturally, we had very high expectations for the company's own hardware back then. 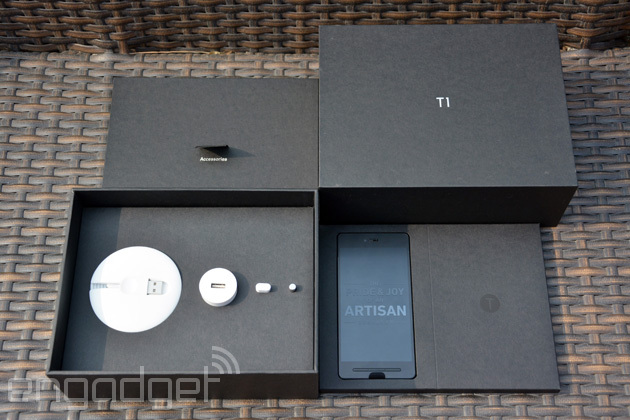 At long last, the Smartisan T1 phone was unveiled in front of some 5,000 people -- along with 2.74 million online viewers -- at the two-hour long event earlier this week, and despite the usual flagship-level specs, it was still full of nice surprises. Don't be mistaken: unlike the low-cost, high-end devices from Xiaomi, OnePlus, Nubia and other young Chinese brands, the T1 isn't about affordability; it's positioned as a more premium smartphone with much more differentiation. How so? Read on to find out. Let's get the boring specs out of the way first. Like most flagship phones these days, the T1 packs a 5-inch 1080p IPS display by JDI, Gorilla Glass 3 on both the front and back, a powerful 2.5GHz quad-core Snapdragon 801 SoC, 2GB of RAM, 16GB or 32GB of internal storage (sorry, no microSD expansion here), a fixed 2,570mAh battery and a noise-cancelling secondary microphone. For the wireless part, you get the usual 802.11ac WiFi, Bluetooth 4.0, GPS, NFC and AT&T-friendly 3G bands. The 3G version will arrive in China first come July (from CN¥3,000 or about $480), followed by a 4G version by end of year (from CN¥3,500 or about $560). 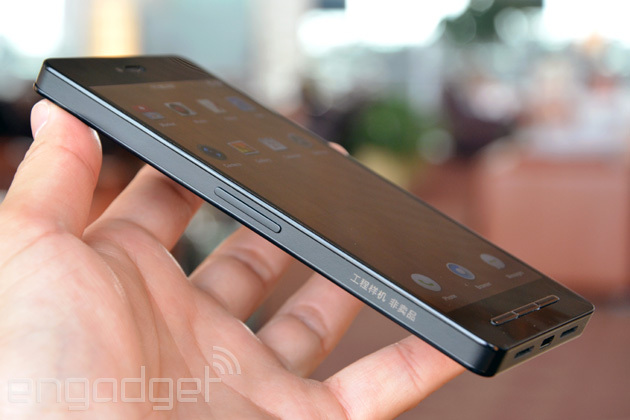 That's right, this isn't your typical cheap Chinese phone, but the price points are still not bad. Photography shouldn't be a problem with the 13-megapixel f/2.0 camera (featuring Sony's IMX214 sensor) and the 5-megapixel selfie camera. CEO Luo Yonghao stressed that his imaging team collaborated very closely -- more so than most other manufacturers have, apparently -- with Fujitsu, who also convinced Smartisan to adopt AcuteLogic's auto white balance software and ArcSoft's scene recognition plus noise reduction technology. We're most interested in the camera app's night mode, which takes six consecutive shots and combines them into one to reduce noise. The panorama mode is also handy, as it lets you toggle between 180-degree mode and 360-degree mode. As the unit we've been given was still running on beta software, we'll save our camera impressions for later. Luo also boasted the T1's audio performance. By using just TI's OPA2604 op-amp chip, his engineers were able to achieve an audio frequency response plus low distortion that claim to be almost identical to that of the Vivo Xplay 3S, a recently launched Chinese phone aimed at audiophiles. For those who aren't familiar, the Xplay 3S uses an extra DAC chip alongside the same OPA2604 amplifier, thus taking up more space on the logic board, consuming more power and potentially producing more heat; so it's impressive that the T1 has a matching audio performance using less hardware. We've had a good listen with our unit and it definitely sounds better than with the "Hi-Fi" mode disabled: the sound stage is more apparent thanks to greater clarity, and the bass is more lively yet not aggressive. Luo added that he had help from two famous music producers in China, and he welcomed all audio enthusiasts to give his phone a serious test drive. At 167g heavy and 8.23mm thick, Smartisan's first smartphone isn't exactly svelte, which isn't a surprise given the heavy focus on the software side; but that's not to say the company did a lazy job on the hardware. Here, Luo took a minimalistic approach with both the phone plus the packaging, and he had help from Apple's ex-lead designer, Robert Brunner, who now runs Ammunition in San Francisco. The studio's work include the Beats branding and products, Barnes & Noble Nook tablets, the Polaroid Cube and Adobe's Project Mighty plus Project Napoleon. It should also be pointed out that the elegant box is made by James Cropper, a 169-year-old fine paper specialist firm from England. 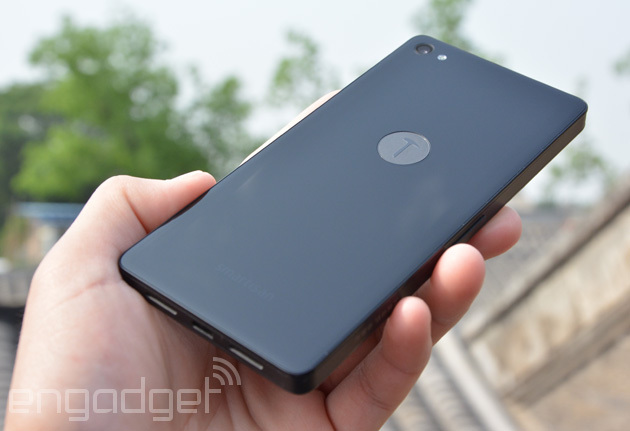 The device is dominated by glass across the entire front and back sides, thus covering 83.8 percent of its exterior. The removable back cover -- which can be swapped with a slightly thicker battery backplate for extra juice -- also features subtle bevels that add character to its glass polish. On the sides, you can see the simple three-layer sandwich formed by the flat fiberglass frame in the middle, as well as the glass panels' glossy plastic frames. It's essentially the same layout as the iPhone 4 and 4S, except here the middle bit is flush with the plastic frames. On a related note, the T1 and the iPhone 4/4S share a similar back cover locking design: you push it up to pop it off, and you secure it with two screws at the bottom (there are also two spare screws provided). This may seem a rather inconvenient way of hiding the Micro SIM slot underneath, but Luo reasoned that he didn't want to have a SIM tray ruining the clean surface on the mid-frame, plus most people only change SIM cards once a year. Obviously, that doesn't apply to road warriors like many of us here at Engadget, but the good news is so far, our back cover still stays secure without the screws, though only time will tell whether it'll become loose. The T1 comes in either black or white. For the sake of reducing the number of black dots on the white version, the proximity and ambient sensors are housed within the same tiny groove as the earpiece at the top, leaving just the front-facing camera right next to them. Alas, the other end of the panel doesn't look as clean thanks to those three physical buttons, even though ornamentation was kept to a minimum -- each is marked with a single, small light dot. Smartisan went the hardware route because it believes capacitive buttons are more prone to accidental clicks. We don't entirely agree, and find it ironic that a company so concerned with design would choose to use rounded keys that bulge out from an otherwise sleek handset. On a more positive note, you can swap the menu button and the back button around in the system settings menu (which unfortunately does look like the one in the earlier versions of iOS), so it doesn't matter whether you're left-handed or right-handed. The T1's design carries heavy emphasis on symmetry. The micro-USB port and the two sets of customizable rocker keys (one for volume and one for brightness) are all centered on their respective sides of the phone. The circular power button near the top right corner mirrors the headphone jack on the top left; and likewise with the speaker grills on both sides of the micro-USB port at the bottom (even though the one on the right is just a dummy, as the loudspeaker and the microphone are tucked inside the left one). The black pre-production unit (at stage "P4.5") we received already looks and feels good, though Luo did point out that the final version will use a black micro-USB socket instead of the white one on our device. That's how OCD he is. The only downsides we've noticed so far are the relatively heavier weight (which arguably also gives a more premium feel), plus the glass panels' inevitable susceptibility to fingerprints. We could complain about the lack of a curved back that would have provided a more comfortable grip, but on the other hand, we do welcome the more secure grip courtesy of the flat composite frame, as opposed to the annoying slipperiness on the latest HTC One's rounded edges. 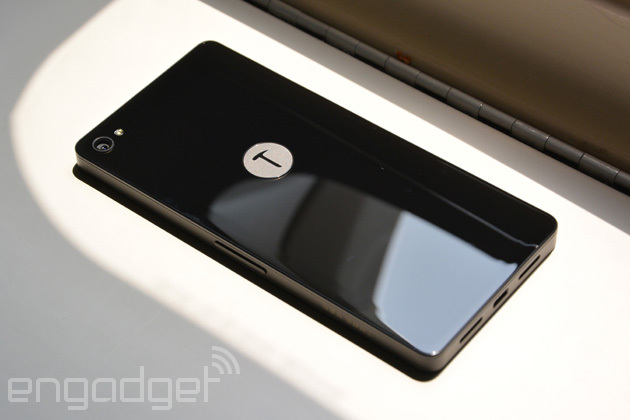 The real differentiator for the T1 is its unique Smartisan OS software. For those who aren't familiar with this Android ROM, its home screen comes with 3 x 3 grid panels plus a three-item dock by default, which is more pleasing to the eye than most other Android launchers. 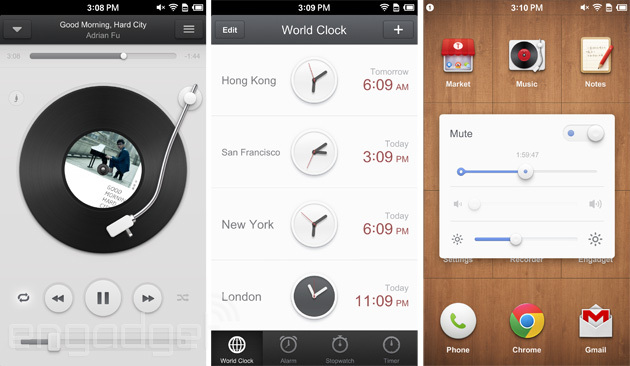 We also dig how the tiles animate every time you unlock the phone, move an icon around or change the launcher's theme. When you pinch the page or hit the menu button, you can zoom out to either a 6 x 6 view or a massive 9 x 9 view, where you can directly launch an app, move an app to another panel, rearrange the panels, hide them or lock them. 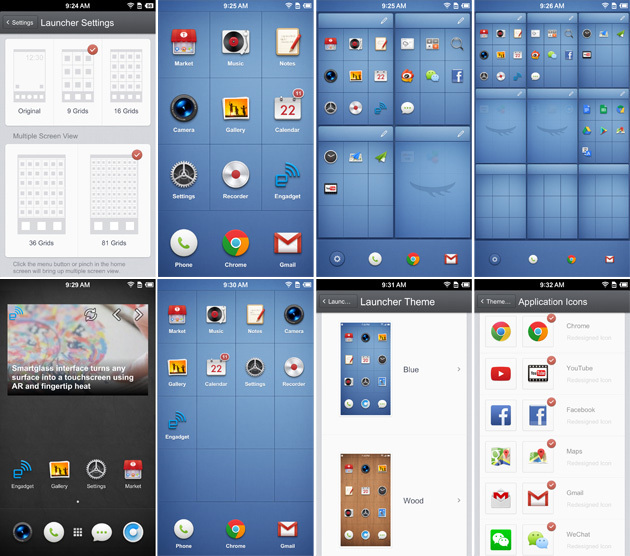 You can also switch to a 4 x 4 grid layout or even back to the conventional, grid-less Android home screen, though the latter would kind of defeat the purpose of using Smartisan OS. One interesting point to make is that while you can set a photo as the lock screen wallpaper, you can't do the same for home screen wallpaper, as Smartisan insists on keeping the launcher look clean. You do, however, have several theme options: black, gray, blue, wood, purple, rock, leather and brown. Just when you think there's limited UI customization here, note that the ROM is kind enough to let you toggle between its custom icons and the original icons for select apps. There are even some "OCD" settings -- all disabled by default -- if you want to toggle minor things like icon labels, battery percentage, icon notification badges and a full-screen swipe-up gesture that clears said badges. The "smart" in Smartisan OS is all about how it solves the many pain points that we come across while using our smartphones. You can check out a detailed list of features in our previous article, so we'll focus on the new ones introduced at this launch event, as well as some of our favorites here. Most notably, there's another reason for why the T1 comes with two sets of rocker keys: you can squeeze both at any time -- even when on standby -- and then let go to instantly take a photo! It's pretty much just a one-step process, as opposed to having to wake the phone and then launch the camera app to hit the capture button. The problem with this handy feature is that it currently doesn't focus in advance, so here's hoping the final software will have this fixed. 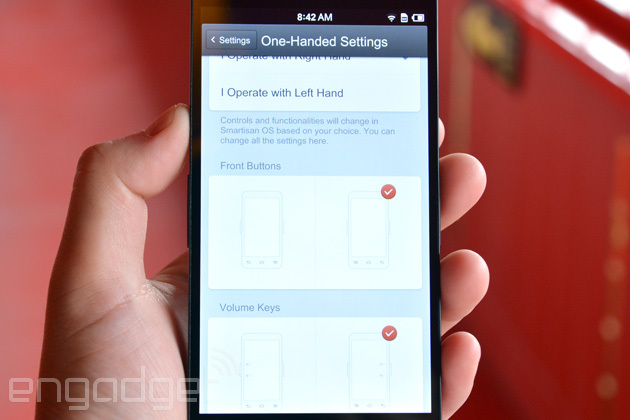 There are a couple of noteworthy gesture-based features as well. One of them is a downward thumb swipe to pull the entire screen down, so that everything is within your thumb's reach. Another cool one is you can trigger a screen rotation at any time by using both thumbs to draw a circle, in the direction of your desired rotation. This comes in rather handy when you're lying on a side, where auto rotation becomes more of a nuisance than convenience. Other goodies include: the ability to create a calendar event from a received text message (date and time are automatically recognized, if mentioned); the option to crop screenshots right after capture; disable lock screen password when connected to your desired password-protected WiFi network (based on the work of jailbroken iOS app CleverPin); text messaging scheduler; and a system-wide mute timer (up to eight hours) in the volume panel. There are also some fun bits like intentionally out-of-sync second hands on the world clock page (but you can shake to sync them), and the turntable arm in the music app lets you fast forward or rewind music (Luo is also considering adding disc-scratching function here). We can go on and on with the list of features. What's certain is that an insane amount of thought has been put into both the hardware and the software, making the T1 a truly unique and passionate product. But that's not all. Instead of buying a case for the sake of protecting your T1, you can pay CN¥200 or about $30 -- a bit less than the typical price of a nice case -- for a "SmartCare+" warranty, which offers two free front or back panel replacements within a year. But if you prefer the old fashioned way, Smartisan will also be selling a bumper case for its phone. In terms of availability, the T1 will be shipping in China come July, but there aren't any plans to launch it outside the country just yet, so interested folks elsewhere will have to rely on either a resident of China or an importer. Looking ahead, though, Luo told us that he plans to eventually launch a phone overseas in about a year or two, and he'll even personally host the keynote in English. For a man who went from zero to launching such an eccentric phone in just over two years, anything is possible.